Still looking for some stocking stuffers? 1919 Kitchen & Tap have you covered with plenty of great ideas. Stop in the restaurant today and take a look at our great t-shirts and pint glasses, or take home some of your favorite 1919 beer in one of our growlers. 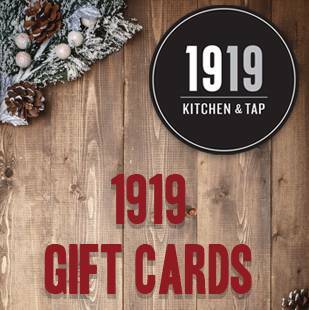 Give the gift that keeps on giving with a gift card to 1919! You can purchases them online here or next time your here, ask your server and they would be more than happy to help you out! Happy Holidays from everyone here at 1919 Kitchen & Tap!